Eat a well-balanced diet. This enables good nutrition and reduces the negative health consequences from eating too much of any one food. Vary your grains. Eat a variety of different grains besides rice like wheat, barley and oats. Consider alternatives for an infant’s first solid food. Parents are encouraged to offer a variety of grain cereals to infants, which can be used as a first solid food instead of only rice cereals. This is in accordance with the view of the American Academy of Pediatrics (AAP) which states that there is no medical evidence that rice cereal has any advantage over other grains as a first solid food, and infants would likely benefit from eating a variety of grain cereals. Type and processing method of rice matters. Sushi rice from the U.S. was found to have low levels of total inorganic arsenic. Parboiled rice tends to have relatively high inorganic arsenic levels. Quick or instant cooking white rice tends to have pretty low levels of inorganic arsenic. Basmati rice grown in south-central U.S. (Arkansas and/or Texas) or rice that does not have any specific origin information other than ‘United States’. 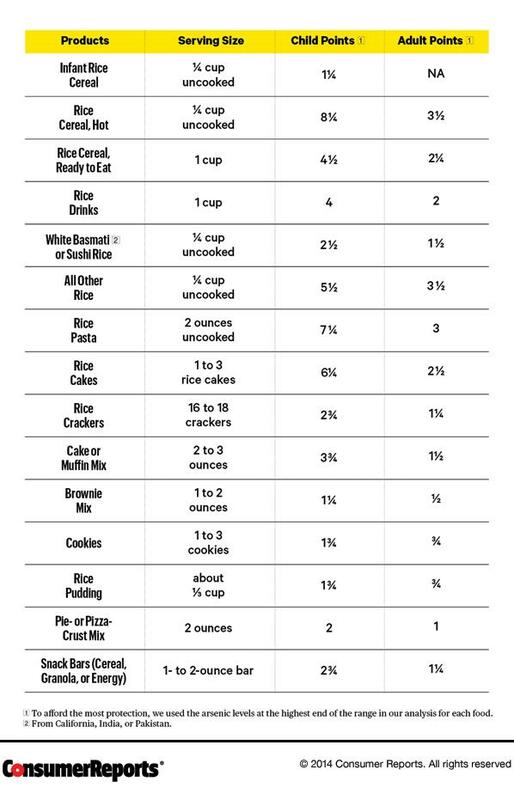 Hot cereals, rice pastas, rice cakes, and some ready-to-eat rice bran cereals (see 7 Points a Week Guide section below). Children should rarely eat hot rice cereals or rice pastas, and should avoid rice drinks. Note that rice drinks are often referred to as “rice milks”, and are marketed as a dairy-free alternative to cow’s milk. 7 Points a Week Guide. Data is used to assign a point value to types of rice and other rice containing foods. Consumer Reports recommends on average not consuming more than 7 points per week from the following table. Note that the risk analysis conducted was based on weight, so a serving of any food will give children more points than adults. There is one more action step you can take. 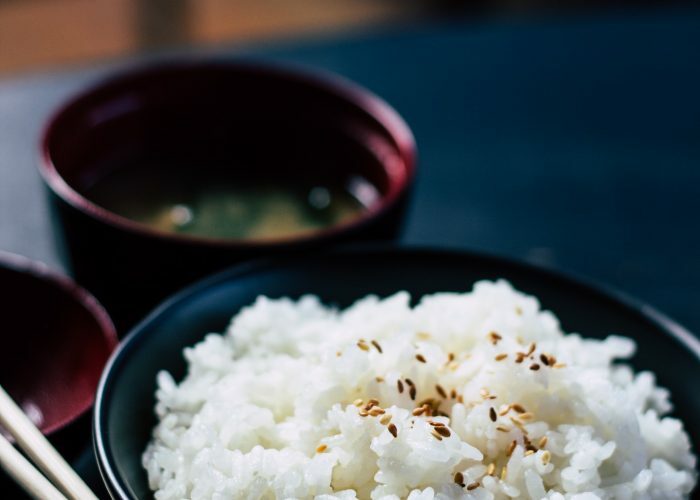 Both FDA and Consumer Reports also suggest the following rice cooking method to help reduce the final arsenic content in cooked rice: Cook one cup of rice in 5-6 cups of water. In my kitchen tips article How Can I Reduce the Arsenic Content of Rice Through Cooking?, I provide some tips on how to do this without ending up with excessively soggy rice. Want to learn more? Read Arsenic & Rice (Part 3): What Are Others Saying About It? For Consumers: Seven Things Pregnant Women and Parents Need to Know About Arsenic in Rice and Rice Cereal. US Food and Drug Administration. https://www.fda.gov/ForConsumers/ConsumerUpdates/ucm493677.htm. Updated November 20, 2017. Accessed February 6, 2018. Questions & Answers: Arsenic in Rice and Rice Products. US Food and Drug Administration. http://www.fda.gov/food/foodborneillnesscontaminants/metals/ucm319948.htm. Updated October 25, 2017. Accessed February 6, 2018. Arsenic in Rice and Rice Products. US Food and Drug Administration. https://www.fda.gov/food/foodborneillnesscontaminants/metals/ucm319870.htm. Updated January 25, 2018. Accessed February 6, 2018.